Platinum silver Acer V3-572G-587W is the latest addition to the Aspire V 15 series 15.6 inch notebooks with the power of Haswell Intel i5 processor, HD display and great graphics performance of NVIDIA 840M graphics card, Dolby sound, 7 hours of long battery life and other great features in a light and slim form. 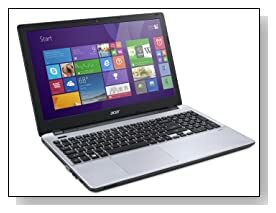 Acer Aspire comes with the 4th generation dual core Intel i5-4210U processor (3MB Cache) at 1.7 GHz base speed and up to 2.7 GHz with Turbo Boost, 8 GB DDR3L SDRAM memory, 500 GB Serial ATA at 5400 rpm spindle speed and the 64-bit Windows 8.1 pre-installed. 500GB would be enough storage space for the majority of computer users. 8GB is quite a bit of RAM to run several apps and browser tabs at the same time without lags. Windows 8 is not everyone’s favourite but the 8.1 version comes with additional features that make it more user friendly and you can always use the familiar start desktop screen. The ultra low voltage i5-4210U (max power consumption of only 15 watts) was released in quarter 2 of 2014, it has the hyper threading function so the two cores offer four way processing and can handle daily tasks just fine as well as demanding office and multimedia applications, similar to the previous 3217U processor. The integrated graphics card is the Intel HD 4400, that is faster than the Intel 4000 but you also have the dedicated NVIDIA GeForce 840M with 2 GB of discrete video memory that is faster than the GT 740M and allows you to play the latest game titles at higher settings but not very demanding ones and those will require lower settings. 15.6 inch HD CineCrystal LED backlit display has the 1366 x 768 pixel resolution and widescreen 16:9 cinematic aspect ratio. Dolby Audio offers cinema-style powerful sound through the two built-in stereo speakers. It also comes with an advanced HD webcam with 1280 x 720 high pixel density with built-in digital microphone and is Skype certified, delivering a great video image in 24 frames per second. 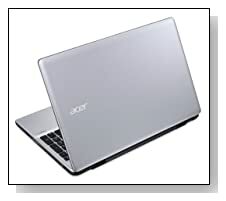 Platinum silver Acer Aspire weighs 5.6 pounds with measurements of 15.02 x 10.08 x 1 inches. Its 5000mAh 6-cell lithium ion battery offers 7 hours of long battery life. Comfy keyboard has a 10-key numeric pad on the side for more convenient data entry. The Precision Touchpad supports multiple gestures and is optimised for Windows 8 experience. Connectivity options include 802.11 a/b/g/n wireless with MIMO technology (2.4 GHz and 5GHz), Bluetooth 4.0, Gigabit Ethernet- RJ-45, 1 x USB 3.0 port with power-off charging, 2 x USB 2.0 ports, an HDMI port with HDCP support and the Digital Media Card Reader. Conclusion: Acer Aspire V3-572G-587W is a low to mid-range priced laptop computer with higher specs and features. It has a premium feel with the brushed aluminium look and platinum silver colour, is a good performer with the very low voltage Haswell i5-4210U processor with turbo boost and hyper threading- although not a powerhouse, has the mid-range graphics processor NVIDIA 840M for great graphics, sound is awesome through the Dolby Audio and stereo speakers, has the multitouch touchpad and 10-key numpad, a high pixel great quality webcam and a good variety of modern connectivity options. Windows 8 is not for everyone but the 8.1 has extra features that will make life easier for those Windows 7 fans. Good value computer overall!